This month's selection is The Secret Garden. Frances Eliza Hodgson, born in Manchester, England, moved with her family to the USA in 1865. In 1873, she married Dr. Swan Burnett. She had already become a writer in order to support herself and her four younger siblings. She became famous for her children's stories, which are still popular today. Many of them have repeatedly been made into films. A memorial sculpture was erected in her honor in 1936 in the Conservatory Garden of New York City's Central Park, depicting two characters from The Secret Garden, Mary and Dickon. 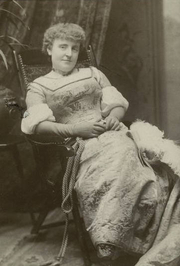 Frances Hodgson Burnett is currently considered a "single author." If one or more works are by a distinct, homonymous authors, go ahead and split the author. Frances Hodgson Burnett is composed of 26 names. You can examine and separate out names.